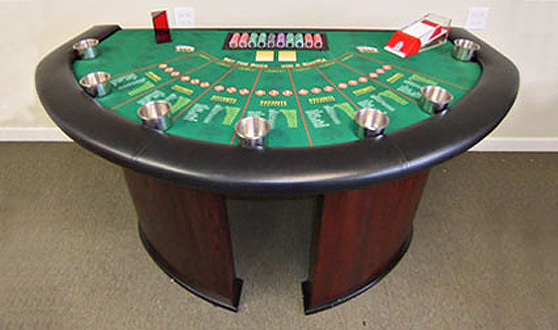 Let It Ride is a casino variation of poker, played on a table similar to a blackjack table. The game is popular because it offers a potential for high pay outs. Because the players are not playing against each other or trying to beat the dealer, camaraderie develops among the players creating a fun atmosphere for everyone. The Let It Ride game is a variation of five-car stud , based on three player cards and two community cards. The two community cards are initially dealt face down. The most distinguishing feature of Let It Ride is that the player is given two opportunities to withdraw exactly one-third of their initial wager. One chance occurs after the player looks at their hand but before the first community card is revealed, and the second occurs after the first community card is revealed, but before the second is revealed. The player may reduce their wager on either of these occasions, or on both, or neither. If the player decides not to withdraw part of their wager, they are said to “let it ride”. In the event of a winning hand after the second community card is revealed, what remains of the player’s wager is paid out according to a payout table such as the one given below. There are small variations in payoffs between casinos, but the lowest paying hand in Let It Ride is typically a pair of 10s; a pair of nines or less is a losing hand, which results in the player forfeiting their remaining wager to the house. When you place a basic craps bet (explained below) all you are doing is placing a wager that the person who is rolling the dice will roll the number he needs to win. You’re essentially just along for the ride. You are in no way in competition with the person rolling the dice. In fact, you are betting on how lucky they are with the dice. “The house” (the casino), on the other hand, is hoping the person rolling the dice isn’t so lucky. This is why you’ll often hear a lot of hooting and hollering and find a sense of camaraderie around a craps table. When the person rolling the dice does good, all the players do good.